Before launching any product-based business, you need to do your homework. That means making sure your product is actually viable — and worth your investment. Without this process, you could wrap up a lot of time, money, and stress into a project that ultimately fails. And that’s bad news all around. If you’re serious about launching a business, don’t skip over the evaluation stage, and be sure to thoroughly evaluate product viability. If you were creating a full business plan, part of that process would include conducting market research. Market research helps you get a better grasp of product viability because it forces you to look at existing competition, current buying trends for your proposed product, and much more. Let’s look at each of these elements individually and break down why they’re so important. Within this portion of market research, you’ll look at supply and demand for the market you want to enter, buying trends, and average prices for your type of product. This will help you get a big-picture view of what to expect when entering this marketplace. 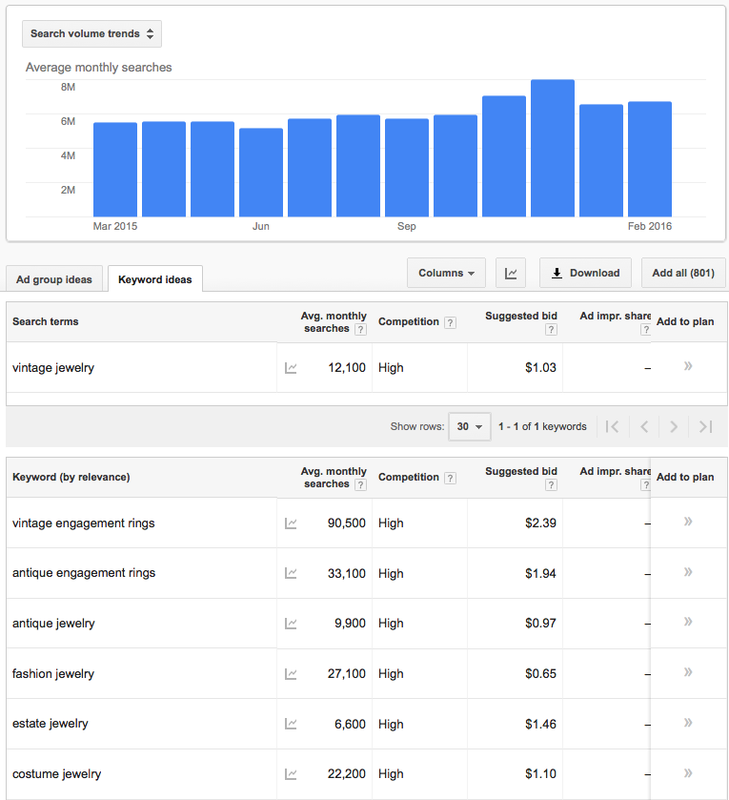 An easy way to begin looking at market information is to use Google’s Keyword Planner tool to gauge the average monthly search traffic for keywords related to your product. In the example below, you can see what type of results you’d get if you were researching the vintage jewelry market. 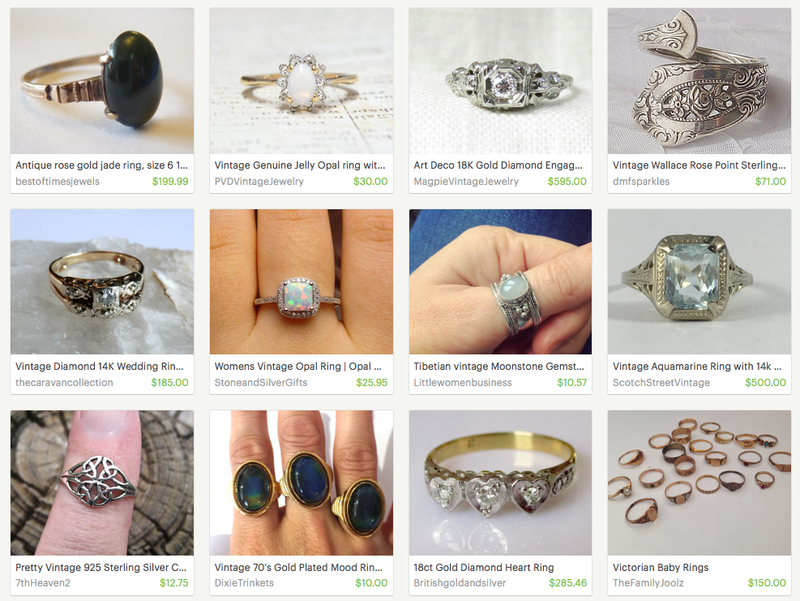 As you can see from the results here, there is a high volume of search traffic for vintage jewelry, so it’s clear that there is an online demand for these types of products. This also means that competition is high, so you’ll need a unique angle that makes you stand out from the crowd, and an aggressive PPC/SEM strategy if you decide to market your products this way. Next, you can use another Google tool, Google Trends, to look at interest in your product over time. You want to be sure you’re entering a market that’s either stable or growing, because this means that you have a greater chance to succeed. Markets decreasing in popularity can be dangerous to enter, because as demand and interest decreases, it becomes harder for you to sell your products. As you can see from the report, vintage jewelry is on a downhill slope, which may be a red flag. If you’ve already estimated what price point you’ll sell your product at, compare how it fits into these findings. Is your number too high? Too low? Once you’ve added in your selling and shipping fees and factored in the price of your time, are you still making a worthwhile margin? The numbers discovered here help provide some basic parameters that will help you price effectively, should the rest of your research point to a viable product. In order to be competitive within your market, you need a unique angle that separates you from all of the other existing retailers. This angle helps a buyer decide why he or she should buy from you instead of someone else. This is sometimes called the SWOT analysis, which stands for Strengths, Weaknesses, Opportunities, and Threats. In each category, you’ll identify these key elements for your product idea. Strengths: What are the strongest aspects of the product/business that make it stand out from the competition? Weaknesses: What are the areas in which your product will struggle to compete with others? Opportunities: What are the established resources you have that create a unique opportunity for product success? Threats: What are the key threats that could limit your product’s ability to sell or succeed in the market? An existing audience you have, via an established blog, YouTube following, etc. (These are prospective buyers that already know and trust you). An interesting backstory to your products, such as how you create them from scratch. Selling for good: Part of your proceeds benefit a nonprofit that helps others. Interesting packaging: Offering an un-boxing experience that’s almost as cool as the product itself. Customization, allowing buyers to personalize their purchases in a way no one else is. This stage will require more research on your part, too. Do extensive searching to find out what your main competitors are already doing so you’re not duplicating an existing element. Take notes on what you find. Not only will this help you better understand the market overall, but it will allow you to get more ideas on what you like and dislike about your competitors’ approaches. Finally, test your idea and unique product angle out on a small focus group of your target market to get their initial feedback. This should be a group of people you do not already know (bias happens, and it’s bad news.) Sites like focusgroup.com or Google Opinions can help you conduct these in an online context to get honest feedback. Now it’s time to look at the details of product to see how realistic it is for you to sell. Especially for eCommerce retailers without a physical store, this can be a hugely important aspect of product viability. Think about it: Everything in your research so far might be leaning on the positive side, but if your product is difficult and expensive to ship, you might discover that the idea is completely unrealistic. What is the average shipping cost? If the item is large or heavy, you may incur expensive shipping fees that actually cost more than the item itself. If you’re considering a shipping service like FedEx or DHL, you can use their onsite shipping calculators to gauge what fees you’ll incur. Is the product difficult to ship? If you’re selling an item that is perishable or requires intensive packaging to ensure it doesn’t break or get damaged en route to the customer, you’ll need to factor in the additional packing product expenses, shipping insurance, and the overall likelihood of whether it will make it safely to the customer in one piece. Are there regulations related to your product? Some items, like nail polish, chemicals, guns, and food products face specific restrictions, both in regard to shipping and for international customs processing. Be sure you’ve verified you can safely and legally sell and deliver your products to the audience you’re targeting. Is there a local provider? If you’re considering marketing your product to a local audience, look at how many competitors are already offering that same product, and evaluate how realistic it is that your product will be unique enough to attract clients who already have these needs met by an established provider. This step in your business is crucial, so don’t rush the process. Do extensive research to be sure you’re not setting yourself up for failure. If you can complete the three steps outlined here, you’ll not only have a better idea of your likelihood for success, but if you do move forward, you’ll be doing so in a strategic, responsible way.